By March 1941 London had seen the nightly raids on it ease a little but only because of bad flying conditions for the Luftwaffe. The officers at Wellington Arch continued with their normal duties but one of them, PC355’A’ Charles Sims, had applied to join the RAF and on Saturday the 8th was due to attend an interview. The only problem was he was also due on No.1 beat at the Palace at the same time. So that he could attend he swapped shifts with Steve Robertson. Sims worked the early turn and then went onto his appointment and Steve settled into late turn in the Palace garden. That evening the Luftwaffe attacked London giving the West End a hammering. 125 bombers of the Luftflotte 3 (Air Fleet 3) based In Northern France with 23,000 incendiaries and 130 tonnes of high explosive targeted ‘A’ Division. Incendiaries were dropped around the Palace, some landing near the North Lodge and Garden Gate. Steve, contrary to orders, started to tackle them and not taking cover in the Bell shelter. Next a bomber attacked the Palace from the south-east, dropping a stick of six bombs. The first two hit the green just outside Wellington Barracks the next three hit the forecourt. The last hit the Garden Gate. 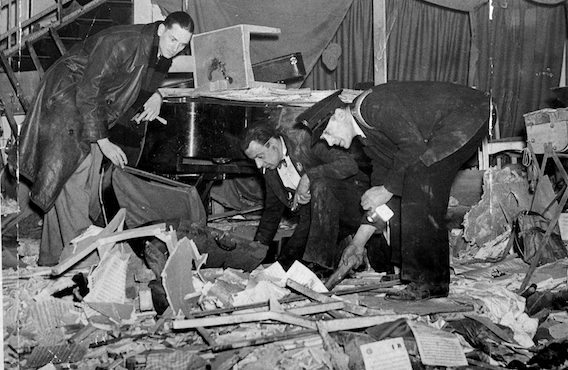 Elsewhere in the West End two bombs fell through the roof of the Rialto Cinema in Coventry Street. In the basement, where they landed, off duty Army Officers and members of Society were in the ‘Cafe de Paris’ dancing to 'Oh, Johnny'. It was regarded as one of London’s safest night clubs. 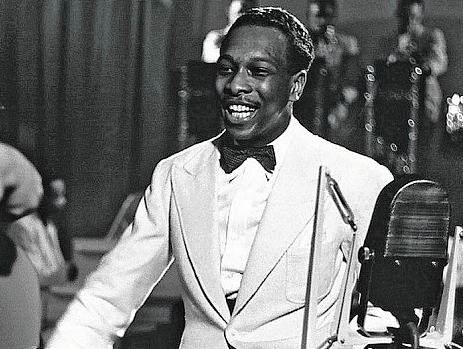 One of the bombs failed to detonate the other exploded killing two members of the Jazz band, including the band leader Ken 'Snakehips' Johnson, the manager, the head waiter and thirty guests. One of the first police officers to attend the devastation was Special Constable Ballard Berkley, who later became famous for playing the Major in Fawlty Towers. In the ensuing aftermath, he would have seen strange scenes such as a lady with a broken leg having it washed down with champagne and looters cutting rings from the victim's fingers. 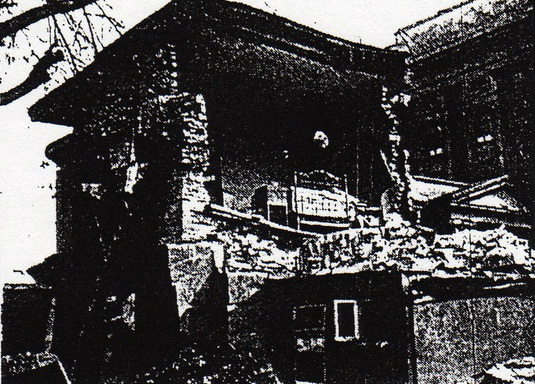 Cafe de Paris after the bombing. Ken 'Snakehips' Johnson, killed whilst playing at the Cafe de Paris. Back at the Palace, as night duty arrived, Steve failed to book off duty. Sergeant Parrot with another officer went to investigate. Climbing the rubble at the Garden Gate they heard a tapping, it was Steve knocking a stone against a large boulder across his chest. At Cannon Row Police Station PC 126’A’ Phil 'Ginger' Eagles was setting up the ‘A’ division First Aid Post for his night duty tour. As the First Aid instructor he was quickly dispatched to assist at the Palace. On arriving he found several Police officers and Palace staff trying to dig away rubble from on top of Steve. Climbing into the hole Eagles found the officer he had taught beats to in a very poor way. Once free from the rubble Eagles could barely find a pulse on the stricken officer. An ambulance arrived and took Steve and the night duty corridor Sergeant, PS44’A’ Bowles, to hospital. Steve died shortly afterwards. He was pronounced dead on arrival at Charing Cross Hospital the cause of death being listed as ‘due to War operations’. Steve Roberson's whistle and chain. 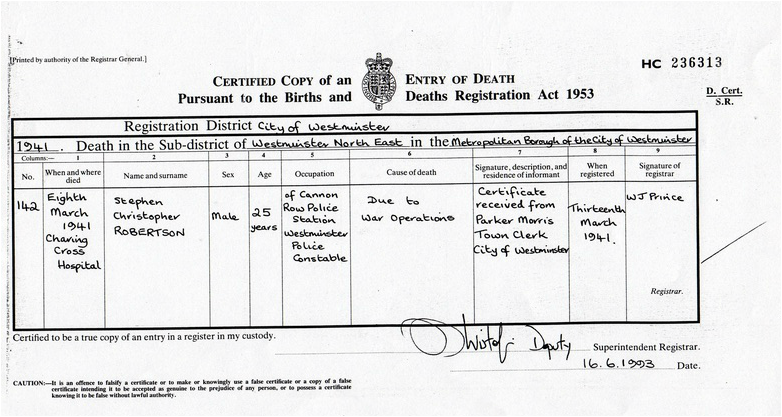 A copy of Steve Robertson's death certificate.